Do you need more High Pressure Ports on your Scuba Regulator? Use this Sonar HP 7/16" Male to Four 7/16" Female UNF Adapter to add three additional high pressure ports to your first stage regulator. Adapter has one 7/16-20 UNF Male to four 7/16-20 UNF Female Outlets (common HP port). 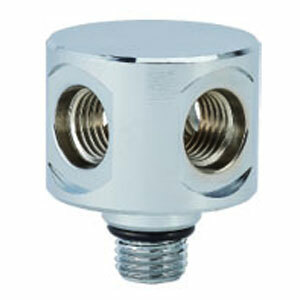 Add three additional High Pressure ports to your 1st stage regulator. This adapter makes a great addition for the safety minded diver who wishes to run a SPG, an air integrated dive computer and other HP hoses off the same HP Port, or for regulators with only one HP port. The 7/16"-20 UNF Male end of this spacer adaptor screws into a standard HP port on a first stage regulator. The four 7/16"-20 UNF Female port ends of this adaptor accept the 7/16"-20 UNF Male end of a standard HP hoses that normally screws into a standard HP port on a first stage regulator.